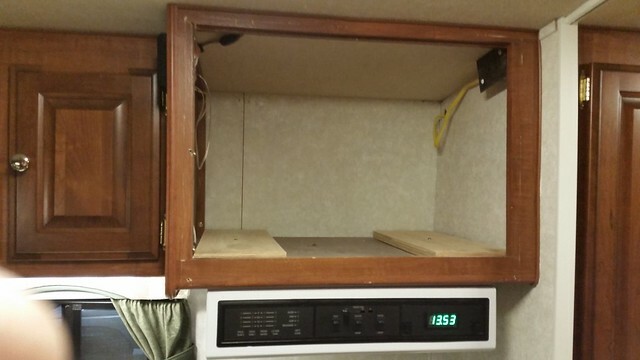 After nine years, I think I resolved the loosening and then rattling of the microwave oven, thanks to this idea from my cousin Richard. 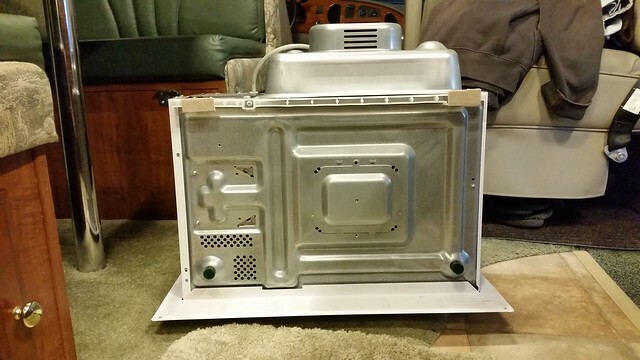 I removed the six screws around the perimeter and pulled out the microwave oven. I drilled the top two and middle two holes in the cabinet bigger to accept spiked "T" nuts, the kind often used in furniture, allowing me to use machine screws and lock washers to replace the four wood screws. 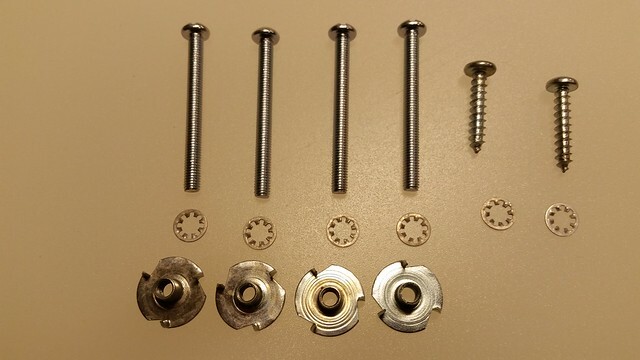 I replaced the bottom two wood screws with other wood screws that cosmetically match the upper four. All hardware used as shown. 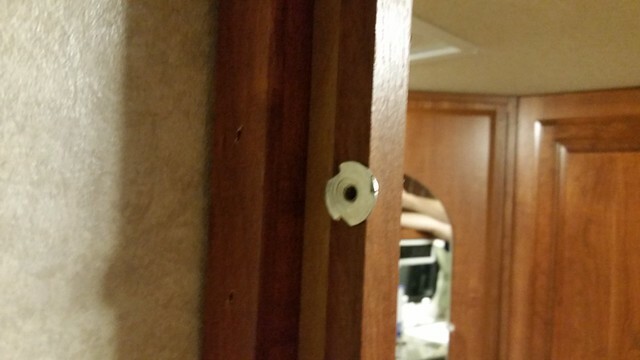 Here is one spiked "T" nut pressed into the enlarged hole from the inside of the cabinet. The hole in the "T" nut is threaded. I added thick felt pads on the plastic rear feet and thin felt pads on the front rubber feet as not to change the height in front. I reinstalled the microwave and was then able to tighten down hard the top 4 screws, much tighter than before when they were wood screws. The bottom two screws had to remain wood screws because there was no means to insert the "T" nuts. Hopefully the rattling is over for good. Previously, I had to occasionally tighten up the six wood screws which helped for a while but they would loosened up again and then came the rattling. I just could not tighten them enough without stripping them. Nice job Ron! (as usual) I am ever in awe at your improvements. We have a little rattle at our microwave and I thought it was because a screw was missing from the light cover on the bottom BUT it is only designed to have one screw so the other side jiggles and rattles. 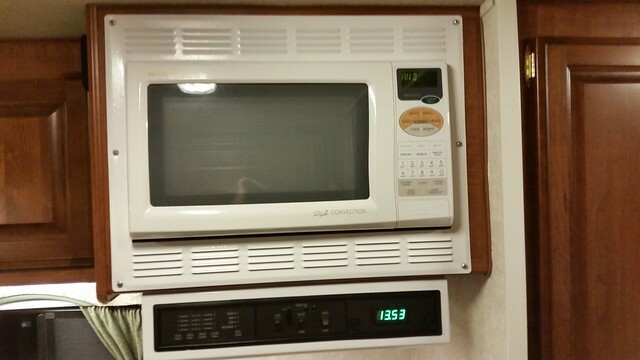 It is a home style microwave, not an RV one so the manufacturers weren't worrying about the rolling earthquake effect. Bobby at the factory suggested a thin bead of silicone caulk to "glue" down that edge of the metal. It can always be removed later if we have to get the cover off but it will stop the jiggle. HOWEVER, we are not Ron Dittmers so it may be awhile before we motivate and actually caulk the thing. That looks great. I had mine out a few weeks ago to investigate and had not yet viewed this post otherwise I would have followed your lead on this tip as well! I think some of my vibration is from the straps that lead from the front to the rear of the microwave to vibrate against the microwave. I'm going to have to pull it back out and inivestigate further, adding your tip here. We are in New England in our PC right now, staying in Twin Mountain, NH. So far so good with the microwave oven during our trip to the region. Rob, you bring up a good point regarding the straps. Though I don't hear any rattling from them, it makes sense to stick on thick felt pads to eliminate any potential. If I ever have the microwave oven out again, I will add thick felt pads. Thank you for that tip. One thing I believe was very effective at reducing microwave oven noise. That was to add thick felt pads to the two rear hard plastic microwave feet. Anchoring the front panel better was equally effective. 9.5 years and counting at noise reductions. I will likely give up when my hearing gives out.